Concept: The film reflects about the human Ego, which sometimes can grow and become a giant that destroys our soul and empties our hearts. 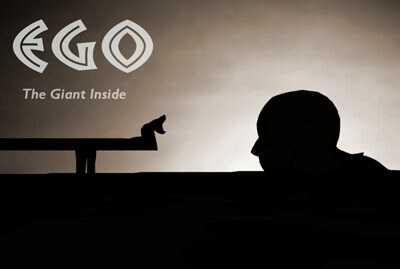 Synopsis: Ego is the story of a man devoured by his Ego. We see how his heart leaves him, not having anymore space to live within his soul. When this happens, the man becomes harsh and totally empty of love. When looking at the ocean and his own reflection, a giant emerges from the waters. It is his own self-image, giant, enormous just as his ego is. The man, horrified, finally understands that his interior giant is destroying everything and he falls in tears to the ground. The understanding brings back his heart and his inner child is reborn as his soul gets a new chance to shine. Trivia: In true multidisciplinary way Ideami did the animation, composed the orchestral music soundtrack, wrote the script and did the postproduction of this animation film that reflects about the human Ego.